Why do we care? Why should a human rights seminar of seven people take up the case of Ismail Alexandrani, an Egyptian scholar currently detained in the Tora prison in Cairo? We are members of the Scholars at Risk class at BCB taught by Kerry Bystrom. The class places its focus at the intersection of theory and practice. It is named for and works in cooperation with the US-based international network of academic institutions to uphold and defend the principles of academic freedom and the human rights of scholars around the world. SAR brought us the case of Ismail Alexandrani. In November of 2015, Alexandrani was arrested upon his return to Egypt after attending a conference on “Deconstructing Islamist Terrorism in Egypt” in Berlin, Germany. The conference dealt with the emergence of terrorism since the overthrow of President Mohamed Morsi in 2013. It particularly focused on the Sinai Region in Egypt, in which most of the attacks occurred. As a researcher, much of Alexandrani’s work focuses on Egypt’s Sinai Peninsula and Islamist movements. Though his articles are critical of the still-present Muslim Brotherhood, which was declared a terrorist organization and enemy of the state in 2013, Alexandrani was held at the Hurghada airport for two days before being charged with the crime of belonging to the very organisation that his work stands against. While the legal limit for a pre-trial detention in Egypt is two years for felony charges, the pre-trial-detention of Alexandrani surpassed this legal limit by several weeks [*1]. On December 13, 2017, he was referred to the country’s military prosecution, which complicates any communication between him and his lawyer. Egypt is party to a number of human rights decrees, including the International Covenant on Civil and Political Rights, which Egypt ratified in 1982. By agreeing to be party to this treaty, Egypt has agreed to protect its citizens’ rights to Freedom of Thought, Freedom of Expression, and Freedom of Opinion, among others. In the case of Alexandrani, the Covenant on Civil and Political Rights has not been upheld. Moreover, his is not an isolated case. He is one of many Egyptian scholars who have been criminalized for simply doing their jobs. 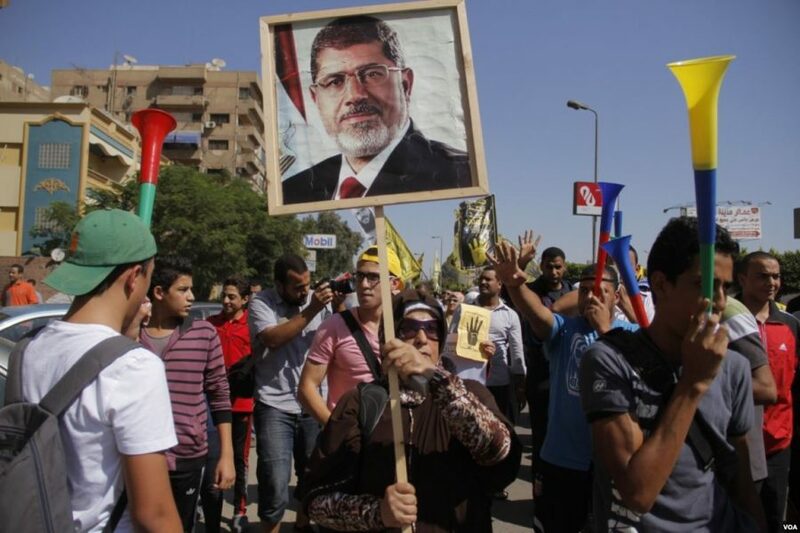 Between Morsi’s overthrow and May 2014, Egyptian authorities arrested or charged at least 41,000 people, according to one documented count, and 26,000 more may have been arrested since the beginning of 2015, lawyers and human rights researchers say. The government itself has admitted to making nearly 34,000 arrests [*2]. When the people in power abuse their position to silence anyone who challenges them, the right to narration is put at stake. The right to life is inseparable from the right to express one’s story. Silencing an individual thus essentially deprives that individual of themself. This semester, we are focusing on the aspect of the voice in our class. With our privilege to speak freely we inherit the responsibility speak in solidarity with those who are silenced. One inspirational example that lends its voice to the cause of Freedom of Expression in Egypt is the Werkstatt der Kulturen in Berlin. On April 19, 2018, the “Workshop of Cultures” hosted a discussion [*3] and a film screening of Tickling Giants. Tickling Giants is a film by Sara Taksler about the Egyptian comedian and heart surgeon Bassem Youssef. Youssef is one of the most famous Egyptian comedians. His show, “The Show”, was watched by millions of people in Egypt and in the broader region. It was threatened by the authorities as well as by people who could not accept the satirical treatment of the figures of authority. “The Show” announced its cancellation on June 2nd, 2014. Youssef, his wife, and his child subsequently left the country for the US [*4]. The documentary highlights the importance of comedy and satire as a means to challenge authority. “The Show” was effective in engaging the public with the politics of the country. Some would claim that this engagement alone, regardless of people’s feelings towards the show itself, is good for democracy. Ismail Alexandrani is not a comedian; he is not a heart-surgeon. Nevertheless, his voice in academia, his published voice, is being silenced. It cannot contribute to the formation of public opinion if his works are not available to the public. Alexandrani himself can no longer contribute to the discourse because he is imprisoned and, possibly, being tortured. One the most extreme ways to silence an individual is through torture. Joseph Slaughter writes: “Torture fashions a nonentity out of the tortured’s subjectivity. It destroys memory by numbing the mind with pain, denying the victim the possibility of reconstructing an integral self through thought” (Slaughter 426). We care not just for this one case which, needless to say, deserves our attention, but because freedom of expression concerns us all. We, the members of the SAR class at BCB, may seem small in number, but we still have our most dangerous and most effective weapon at hand: Our voice. We can only imagine the potential impact of our advocacy if we join our voices with others’. So far, our partners include Die Bärliner and Scholars At Risk. Hopefully, you will join in, too. You may be asking yourself: What do we do with our voices? How could we possibly use them to support Ismail Alexandrani? Campus Conversations will host an event dedicated to the topic of Freedom of Expression that features a presentation from our seminar on Ismail Alexandrani. At lunch on the same day – in the cafeteria – we will present the making of a collective artwork in solidarity with Alexandrani that will be exhibited at Pankumenta from May 5-7. At each event — in addition to discussing the broader issue of freedom of expression — we will be asking students, faculty and staff to sign letters asking for the release of Alexandrani as well as for assurances that he is being held in humane conditions and has access to his lawyer. Please join us. We must remain mindful and hopeful about the issues surrounding us both in our own backyards and the world we live in connection with. To ignore this duty is to refuse one’s own right of expression. According to the information available about his detention and our own calculations, Alexandrani spent 2 years, 1 month, and 13 days in pretrial detention. This is 774 days. The discussion was moderated by Bard College Berlin alumna Aya Ibrahim. Other members of the team who worked on “The Show” are said to have found other niches in which they keep fighting for space for freedom of expression. This expression is both a metaphor for challenging the powerful authority and the title of Bassem Youssef and Sara Taksler’s film. Human Rights Watch, ‘We Are in Tombs’ | Abuses in Egypt’s Scorpion Prison.” Human Rights Watch, 12 July 2017, www.hrw.org/report/2016/09/28/we-are-tombs/abuses-egypts-scorpion-prison. Slaughter, Joseph. “A Question of Narration: The Voice in International Human Rights Law”, in: Human Rights Quarterly, Vol. 19, John Hopkins University Press, 1997, Austin, TX, pp.406-430. Tickling Giants. “Five Takeaways From The Film.” Edited by Tickling Giants, Tickling Giants, www.ticklinggiants.com/five-takeaways-from-the-film. Werkstatt der Kulturen. “Beyond Spring- Arabische Filmreihe.” Werkstatt Der Kulturen, 19 Mar. 2010, www.werkstatt-der-kulturen.de/index.php?id=104&datum=2018-04-01&filter=Komplett&detail=3817&mode=archiv. DGAP E.V. 2015, DGAP E.V., dgap.org/en/node/27310.